In light of recent professional and political agendas relating to improving the quality and culture of nursing care, transitions to practice for all healthcare professionals is an area that needs further examination. The leap from being a student to being a registrant has been highlighted as a difficult and challenging period to navigate, despite the best efforts of preceptorship programmes. Although the topic of transition in nursing has been explored in recent literature, this text is a welcome addition and one that provides insight to specific themes and concepts associated with progressing through the various phases in professional practice. Four sections focus on professional practice, working together and communication, quality in practice, and caring values and duty of care. 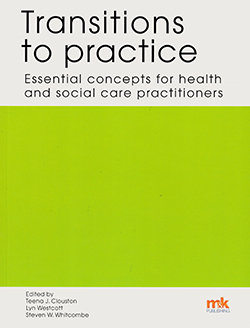 All the chapters have been written with nurses and other health and social care professionals in mind and with reference to Nursing and Midwifery Council and Health and Care Professions Council regulatory standards. The subject areas discussed provide valuable information for nursing students, encouraging a reflective approach to professional practice and challenging personal assumptions. This book is thought provoking and easy to read. With useful case examples that clearly demonstrate how relevant subject discussions are related to practice, it will help nursing students critically consider their impact through the varying transitions from student to registrant and beyond. It also provides a useful evidence base to stimulate thinking and explores various approaches to the many complex challenges nurses face in healthcare organisations.